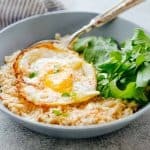 These savory garlic oats with a masala fried egg are healthy, delicious and a great way to switch up breakfast when you are bored of regular sweet oatmeal. The runny yolk adds a gorgeous creaminess and the crispy edges add crunch. Make it a breakfast salad bowl with mixed greens or toss it up with some spices for a really satisfying breakfast. How long have we known each other for now? If breakfast still isn’t your favorite meal of the day, then we may need to talk. While most days, we only have time to grab a quick cup of coffee and fry some eggs, we really love spending time tucking into a good breakfast when we can. That’s also the only part of the day when we truly resolve to stay within the boundaries of what we call ‘healthy’. Okay okay borderline healthy. 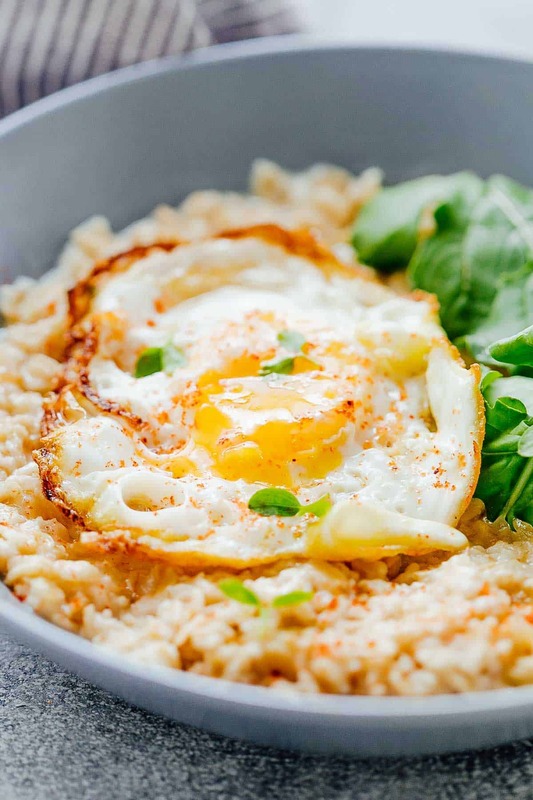 But these savory garlic oats topped with a masala fried egg are going to change everything. For you and me. We eat a lot of oats in all forms, but lately I’ve been really tired of eating them sweet. So I started experimenting with a lot of savory oat recipes which are just as satisfying but healthier. You are totally omitting out the 2-3 teaspoons of sugar you might normally add to your oatmeal. 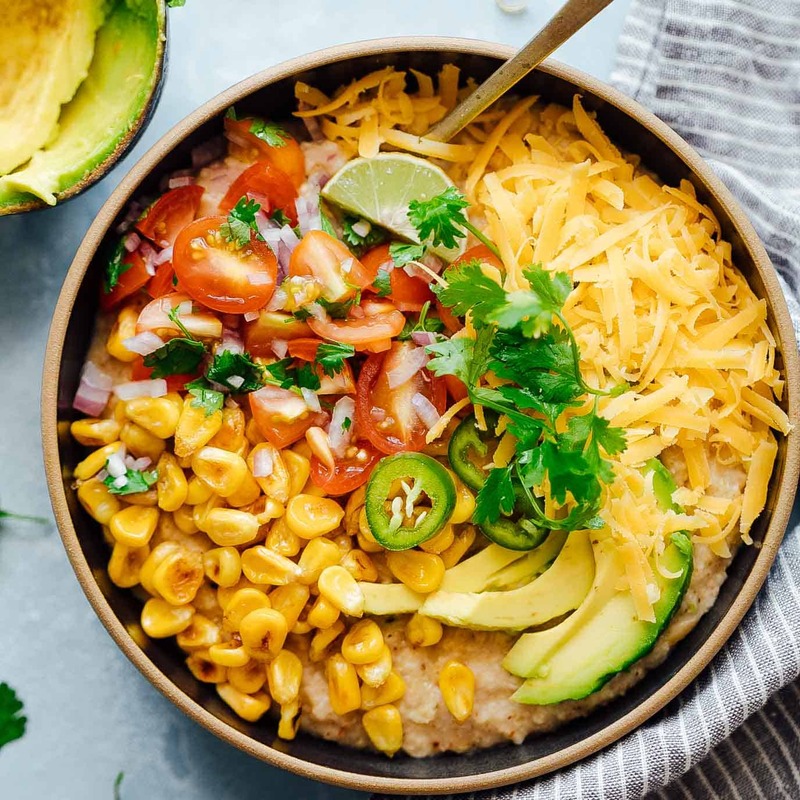 These savory garlic oats are versatile and how! If we are going to stay friends, you have to try this out. And don’t just stick to the recipe. I’m giving you complete freedom to go ahead and explore your heart out. In fact, we may just bond over how to make oats more awesome. That could be our thing you know. Because who doesn’t want oats with a twist for breakfast? Raising hands and jumping up and down. Guys seriously, I can’t take my eyes off that yolk! I tried to keep them healthy with not too much cheese. An ultimate test to my self control, but if you are feeling like a dreamy, creamy bowl, go ahead and up the quantity. Or experiment. Blue Cheese maybe? Or even a little Gorgonzola? Did I hear you say yes? 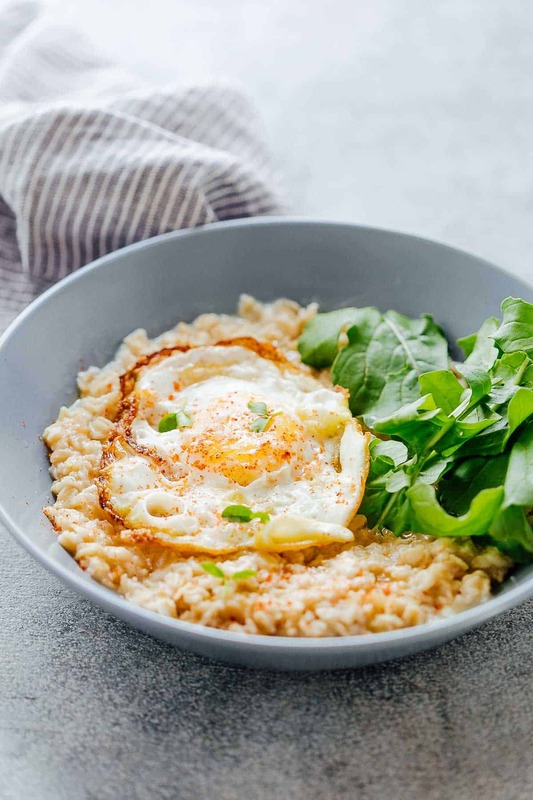 These savory garlic oats with a masala fried egg are healthy, delicious and a great way to switch up breakfast when you are bored of regular sweet oatmeal. The runny yolk adds a gorgeous creaminess and the crispy edges add crunch. Cook Oats: Heat a teaspoon of oil in a pan and add the minced garlic. Saute the garlic for 15 seconds and add oats. Stir the oats for a few seconds and add all the water, salt and pepper. Bring this to a quick boil, and simmer for 3-4 minutes, by which time, the mixture would have thickened up into a porridge like consistency and the oats will be cooked. Adjust the consistency by adding more water if required. Just before taking oats off the stove, add cheese and basil and mix. Fried Eggs: In a non stick pan, add the remaining oil and fry the eggs one by one. Top each egg with salt and paprika or chili powder. Feel free to experiment with different herbs, cheeses and even toppings like sundried Tomatoes, Olives or Jalapenos. Adjust water to keep oats to your desired consistency. Feel free to swap the fried egg with soft boiled eggs or scrambled eggs. But we prefer the crispy, fried egg with a runny yolk. Awww thanks Ankita, this is one of my favorites too! Thanks Priya. Hope you try it sometime! Love the idea of garlic in porridge. I always like to have a healthy start to the day and when winter comes along I might start experimenting – great idea. wow! perfect wholesome breakfast and so delicious! You must! We are having this for breakfast almost every day now. Let me know what you think if you end up trying this out. LOL that makes the two of us! I can’t take my eyes off the yolk either. Oh! This looks like it may be Hubby’s new favorite! I should make this for him soon. Thanks for sharing! Thanks Lydia, you must try this, and you may just never go back to the sweet stuff! THAT YOLK THOUGH!! Hubba hubba!